Kumar Sangakkara (Sinhalese: කුමාර සංගක්කාර; born 27 October 1977) is a former Sri Lankan cricketer and captain of the Sri Lankan national team. 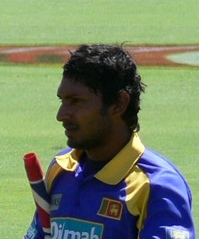 Sangakkara is widely known to be the most influential players of the sport. India always plays a big tournament in a very settled manner. They trust their players and are always consistent in their selection. They always approach a game with a sense of confidence in their abilities and the selection they have made. When it comes to Pakistan, they come to tournaments unsettled, with a lot of controversy and lots of doubts over selection. There seems to be lot of talk even within the team and around the team, even by the management. When it comes to crucial rivalry and the stakes are high, India seems to control their emotion and execute their game-plan. Whenever Pakistan play India, the former seems to be rattled. India always seem to be the more mature side in World Cups than Pakistan, no matter how many senior players are there in their squad. Sangakkara on how Pakistan is a better team than India, quoted on Sports.ndtv.com, "Why Pakistan Can Never Beat India in World Cups - Kumar Sangakkara, Sunil Gavaskar Explain", March 21, 2016. Interviewer: As a captain, there are naturally different kinds of challenges... did you find the expectations of yourself change too much? Sangakkara: Sometimes, you fall into that trap where you think, 'I'm the captain and I've got to do a lot more than I was doing before'. But it's very important to compartmentalise leadership. When you're batting, you bat as a batsman and find ways to score runs. To be effective for your side, you don't have to have the captain's cap on all the time because it's just of no use, as if you do get out and are sitting in the dressing room, there's not much captaining left for you to do. It's important to understand that when you're fielding is when you're essentially marshalling your troops, strategising and making the hard decisions. That's when you're really captaining. If you can break that down and come to grips with it, it becomes a bit easier. Interviewer: A captain is as good as his team - thoughts? Sangakkara: Being a good captain is about pulling your own weight in the side and making sure you perform. The better you perform, the easier captaincy becomes. It's a nice interesting balance about your own performance and also surrounding yourself with players of quality which makes captaincy the easiest job because you know you have match-winners in your side. You know people can execute whatever's asked of them. So decision-making becomes very easy. Take Ricky Ponting and the Aussie side that he had under him for a few years. Hard decisions were very rare because you just had to look at your team and knew exactly what they were capable of. Interviewer: How important is it for a captain to be a people's person? Sangakkara: It's a great sport to play. It's a very special sport because it's one that's got a certain character to it that is not present in other sports. But there's also an expectation of a cricketer that is to be much more than in any other sport. So it's a great test of character for a young kid, but at the same time, it's a great skilful athletic sport that's a viable profession that gives great opportunities as long as you understand that playing this game to the best of your abilities in the most honest manner possible is what will open those doors for you. So if you're taking up the sport, take it up seriously. Have fun, enjoy it, otherwise you won't do well, but when you do get those opportunities, ensure that you leave a mark. Referring to the lose of Sri Lanka from a game against Pakistan (cricket), quoted on ZNews.India, "Kumar Sangakkara calls for reassessment of Sri Lankan team ahead of World Twenty20", March 5, 2016. It was rumored that @ShaneWarne was bitten by a snake during a dare on the show but don't worry twitterverse the snake is absolutely fine. twitter post, Sangakkara referring to a recent incident when Shane Warne plunged headfirst into a box filled with snakes on an episode of Network Ten show "I'm A Celebrity... Get Me Out Of Here!". When Shane lowered his head into the box, an aggressive anaconda bit him, quoted on Sportskeeda, "Kumar Sangakkara trolls Shane Warne over the 'snake-bite' incident", March 3, 2016. "It's the last time I'll play a four day game here.I'll be 40 in a few months ,this is about the end of my time in county cricket." "The biggest mistake that sometimes you can make is that you think you're better than you really are: Kumar Sangakkara"
Mohan De Silva, the Honorary Secretary, Sri Lanka Cricket (SLC), on Sangakarra joining the Sri Lanka squad in India, quoted on Deccan Chronicle, "Kumar Sangakkara to join Sri Lanka squad in India", March 16, 2016. Former Australia wicketkeeper Adam Gilchrist has called Kumar Sangakkara a terrific player, quoted on sports.ndtv, "Kumar Sangakkara Was a Terrific Player, Says Adam Gilchrist", August 24, 2015. Sunil Gavaskar, "Kumar Sangakkara's Retirement Will Hit Sri Lanka Hard, Says Sunil Gavaskar", August 24, 2015. Disappointed we didn't win it for Sanga. We promised him we would play our best cricket, but we didn't. On behalf of the team, we can't thank Sanga enough for his services over the last 15 years. Sri Lanka captain Angelo Mathews said that he was disappointed that the team could not gift a farewell win to batting great Kumar Sangakkara, who retired from cricket at the P Sara Oval, quoted on sports.ndtv, "Angelo Mathews Unhappy Sri Lanka Did Not Win it for Kumar Sangakkara", August 24, 2015. I just want to congratulate Kumar again on a wonderful career. I have spoken a lot about him, everyone has, in the last week, but I can't help saying it again that it has been an absolute pleasure playing with you. Virat Kohli, "Virat Kohli Says it Has Been a Pleasure Playing With Kumar Sangakkara", August 24, 2015. He is an extremely messy person, the messiest on earth. But he loves to cook and absolutely loves making pasta at home. We never discussed cricket at home and always made sure there was life away from the sport at home. Conversations revolved around kids and made sure there was life beyond the sport. Kumar is a very relaxed, open sort of person. He has never demanded much. (But) He will have to get used to our routine now. He will of course still play some cricket for a year or two. Kumar's wife, Yehali Sangakkara, quoted on sports.ndtv, "Kumar Sangakkara is Extremely Messy, Would Love to Have Him at Home Now: Yehali Sangakkara", August 21, 2015. This page was last edited on 24 May 2017, at 02:18.